Connecticut forward Kaleena Mosqueda-Lewis and Notre Dame guard Kayla McBride scramble for the ball during last year’s NCAA tournament championship. Maryland and South Carolina have really good women’s basketball teams — two of the four best in the country. But Connecticut and Notre Dame, their respective Final Four opponents on Sunday in Tampa, are a cut above. They’re ranked No. 1 and 2 in the country by the AP, the coaches and the tournament selection committee. They’re the favorites to reach Tuesday’s final in our March Madness predictions and in Vegas. They played each other in last year’s final. And, best of all, they have a rich history — one that isn’t as one-sided as UConn’s recent dominance suggests. Notre Dame has dealt UConn seven of its 18 losses since the start of 2007. In other words, 39 percent of the time UConn has lost in the last eight-plus years, it’s been against Notre Dame. If UConn and Notre Dame play each other in the final, it’d be their 21st meeting since the start of 2007 — the latest ESPN Stats & Info data available. They played 12 regular-season games (11 back when both were in the Big East), plus three Big East conference finals and one semifinal. They’ve also met four times in the last eight Final Fours, with two wins apiece. A Tuesday meeting would be the rubber match. Maryland and South Carolina have been good, but they simply haven’t been as dominant. 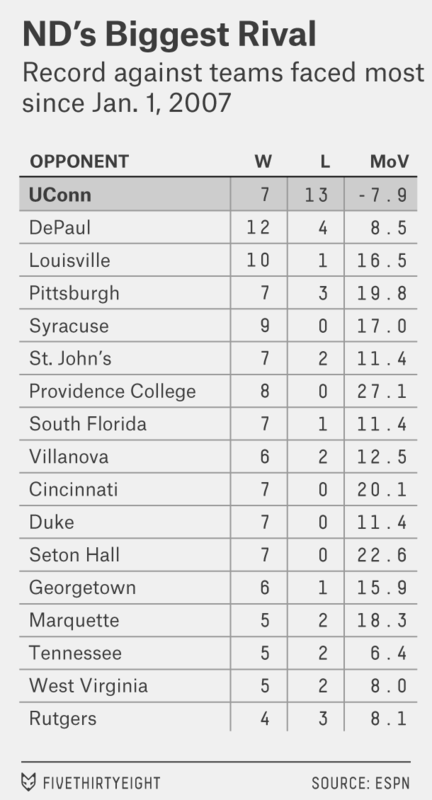 UConn has won 94.6 percent of its games since the start of 2007, by far the best in the sport. 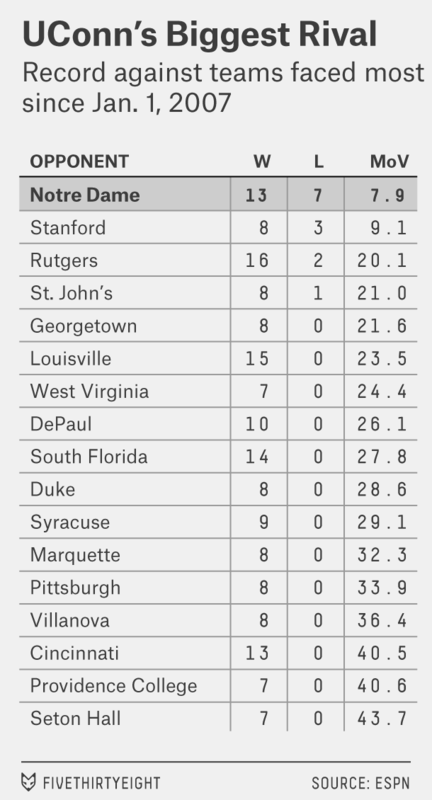 Notre Dame ranks fifth, at 84.1 percent. (Stanford, Green Bay and Baylor are second, third and fourth.) Maryland is 11th, at 80.6 percent. And South Carolina is 53rd, at 64.3 percent. 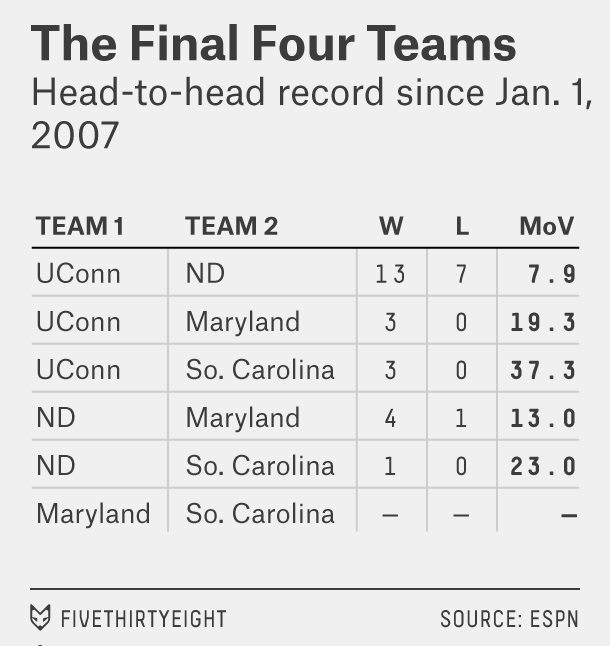 But South Carolina’s and Maryland’s relative inconsistency, coupled with UConn’s and Notre Dame’s late, lamented conference rivalry, means they have a much thinner record against the rest of the Final Four. 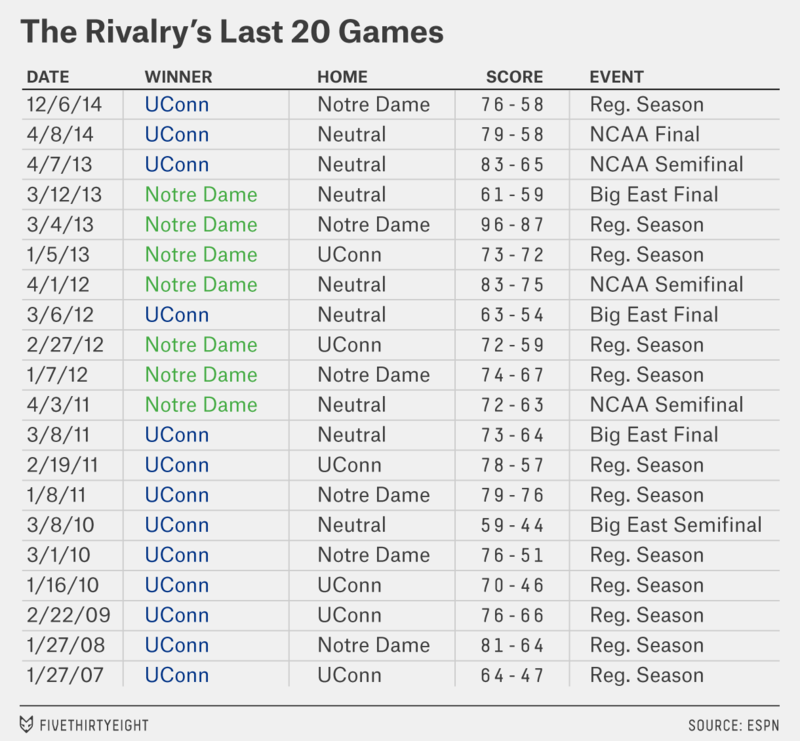 So let’s look more closely at the UConn-Notre Dame rivalry. UConn has won 13 of their last 20 matchups, or 65 percent. That’s as close as UConn gets these days to a balanced rivalry — it’s the lowest winning percentage UConn has against any team it has played more than five times since the start of 2007. Every team but one that has played UConn at least once in that time has a losing record against the Huskies. (The one exception is longtime rival Tennessee, which won their only recent meeting.) More than 90 percent of UConn opponents haven’t beaten the Huskies even once, including four teams that have played them at least 10 times. Also notable, for a team that has regularly all but clinched its games by halftime, UConn has beaten Notre Dame by an average of less than eight points per game in their 20 meetings. That’s the closest average margin for any UConn opponent that has played the Huskies more than five times since 2007. UConn, meanwhile, is responsible for a big chunk of Notre Dame’s losses since the start of 2007: 13 of 49, or 27 percent. UConn is the only team Notre Dame has played in more than six games in that period that has a winning record against the Fighting Irish. Notre Dame’s recent wins against UConn all came in an astonishingly short spell: The Fighting Irish won seven of eight meetings over a stretch that started with Notre Dame’s upset of UConn in the 2011 Final Four. Notre Dame star Jewell Loyd, a junior and the team’s leading scorer, is the only current player who was a major contributor for the Fighting Irish when they last beat UConn. If it’s business as usual for both teams on Sunday, we’ll see them renew their acquaintance in the final on Tuesday in Tampa, in the latest edition of the closest thing to a rivalry that Auriemma’s dominant UConn team has these days.